Dr. Samir Parikh is a consultant psychiatrist and the Director of Department of Mental Health and Behavioral Sciences, Fortis Healthcare. He is one of the leading academic experts in the field of mental health and conducts training programmes and courses for doctors, Psychologists and allied specialities, and has initiated several awareness campaigns for the community. Dr. Samir Parikh is a very well-known speaker and has been a speaker at various national and international forums on mental health issues. Dr. Parikh is amongst the most well-known top experts of the country on mental health issues and has played a key role in enhancing the image of mental health in the country. 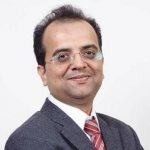 Dr. Samir Parikh also has a prominent presence in the media with various columns in newspapers and a presence on television channels and websites. Dr Samir Parikh is one of the top Psychiatrists in Delhi and has over 17 years of experience in this field. Dr. Samir Parikh has done his graduation (MBBS), and Post-graduation (DPM and MD-psychiatry) from Civil hospital, Ahmedabad, and topped the university in both.